Creativeworld kickstarts the year by launching the NHS Quit Squad’s Smokefree Sidelines campaign. 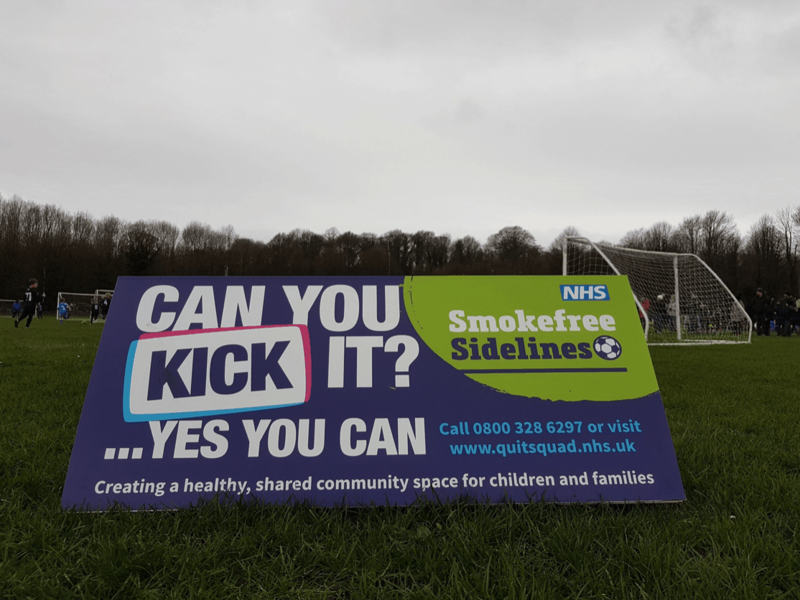 The team at Creativeworld was absolutely delighted to see the launch of the Quit Squad’s #SmokeFreeSidelines in Penwortham. The new initiative focuses on denormalising smoking at grassroots sporting events in the hope of creating a healthy, shared space for young people and families. On launch day, 54 games were played in the Mid Lancs Colts Junior League, which meant approximately 800 young people were able to play football without the sight of parents and coaches smoking or the effects of second-hand smoke. As a result of previous marketing support provided by Creativeworld, the Quit Squad service saw an overall increase in service awareness and recognition of the brand through utilising the Quit Squad concept in all resources. Having seen these results, the Quit Squad approached Creativeworld for their Smokefree Sidelines project as they knew they could deliver. This time the team created a new brand identity to be used across various marketing channels and produced the artwork for sideline boards, banners, bibs and posters to help increase awareness of the new campaign.